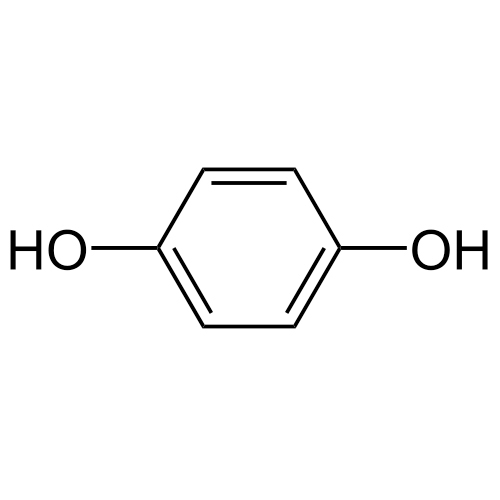 Benzene-1,4-diolThe exposure routes of Hydroquinone include inhalation, ingestion, skin, and/or eye contact. Hydroquinone is classified as a carcinogenic to animals, but the carcinogenic effects on humans are unknown/unclassifiable as a cariogenic to humans. Hydroquinone causes skin irritation, cumulative corneal damage, it’s a mutagen, central nervous system effects, and is a suspect of teratogen. The exposure routes of Hydroquinone include inhalation, ingestion, skin, and/or eye contact. Symptoms: Irritation of eyes: conjunctivitis; keratitis (inflammation of the cornea), blurred vision; CNS excitement; green-colored urine; nausea; dizziness; sense of suffocation, rapid breathing; muscle twitches, delirium; collapse; skin irritation, sensitization, dermatitis. Ingestion Acute: Headache, ringing in the ears, dizziness, nausea, vomiting; shortness of breath; convulsions. Acute Effects: Tinnitus (ringing in ears), dizziness, headache, nausea, vomiting, dyspnea (labored breathing), erosion of the gastric mucosa, edema of internal organs, cyanosis (bluish coloration of the skin due to lack of oxygen in the blood), convulsions, delirium, and collapse may result from the ingestion of a large amount of hydroquinone in humans. Chronic Effects: Chronic occupational exposure to hydroquinone dust has resulted in eye injuries, which varied from mild irritation and staining of conjunctivae and cornea to changes in the thickness and curvature of the cornea, loss of corneal luster, and impaired vision; prolonged exposure is required for the development of severe ocular effects. Nausea, vomiting, abdominal cramps, and diarrhea occurred in humans who chronically consumed water contaminated with hydroquinone.